Since 1983 when the SMA decided to implement an earlier (1952) decision to accept Africans into the Society of African Missions there has been a steady stream of candidates entering the SMA formation programme in Nigeria (and many other countries). After the initial contacts have been made and the candidate accepted for training in the SMA he begins with a nine-month Preparatory Programme in Kagoro, Kaduna State. Directed by Fr John O’Keeffe SMA (Cork) it lasts about nine months. Our picture shows the most recent group to pass out from Kagoro. Front row, left to right: Fr John O’Keeffe SMA, Kishak Justin, Samuel Tseregu and Fr Dominic Anthuvan SMA (from India). Back row: Martin Okereke, Kim Vincent, Michael Gabriel, Markus Yasooa and Amos Cletus. If, at the end of the programme, the candidate is deemed suitable for the SMA he transfers to do a 4-year Philosophy Degree course at the Ss. Peter & Paul Major Seminary in Ibadan, Oyo State. During these years he lives at the SMA House of Studies, a short distance from the seminary. There he also undertakes additional studies to familiarise himself with the life and mission of the Society he wants to join for life: the Society of African Missions. At the end of the ISY those who are considered suitable and who specifically ask to join the SMA are admitted as temporary members of the Society for a one-year period. During that year they are assigned to an experienced SMA priest to observe the work of a missionary priest in his parish. The ‘Stagiaire’ (as he is called during this period) is also given tasks to do in the parish to give him an opportunity for a ‘hands-on’ experience of missionary life. Read here the article of Julien Esse on his mini-Stage in Tanzania. At the end of the Stage Year the SMA student may ask to be permitted to renew his temporary membership. If those responsible for his formation deem him fit to do so he renews his membership for a further year. (The renewal of yearly commitments takes place until the student reaches his final year of Theology when he asks to be admitted as a permanent member of the Society). or Nairobi, Kenya (attending Tangaza College, a constituent College of the University of East Africa). These houses have an international flavour with SMA students from all over Africa as well as those from Ireland, India and Poland. (SMA students from Philippines do all their studies in their home country, though Stage is undertaken in Africa, usually Ghana or Tanzania where Filipino SMA priests are ministering). Towards the end of his Theology studies the SMA student must decide if he wants to make a life commitment to the SMA and request membership in the Society and ordination as a deacon. When all the necessary assessments have been done – by the SMA Formation House staff and the Bight of Benin Superior and Council the application is forwarded to the SMA Superior General and Council for consideration. If he is accepted for permanent membership the temporary member takes a Promise to remain in the Society for life and to accept the tasks entrusted to him by his Superiors. 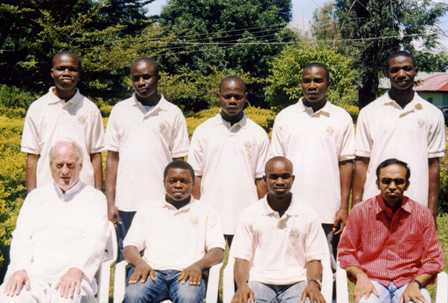 The following year the SMA deacon returns to Nigeria to be ordained a priest. After his holiday with family and friends he leaves his own and takes up his first appointment as an SMA priest, normally to a mission outside his own country. 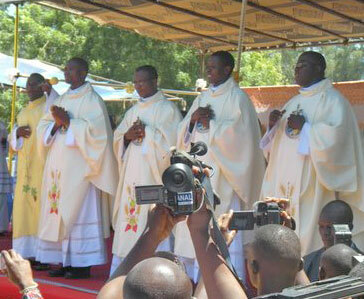 Our picture shows the four SMA priests ordained in Benin Republic by Bishop Ganye in 2010. Ad Multos Annos! For more information on the training of an SMA student click here.